Water Purification, a volume in the Nanotechnology in the Food Industry series, provides an in-depth review of the current technologies and emerging application of nanotechnology in drinking water purification, also presenting an overview of the common drinking water contaminants, such as heavy metals, organics, microorganisms, pharmaceuticals, and their occurrences in drinking water sources. As the global water crisis has motivated the industry to look for alternative water supplies, nanotechnology presents significant potential for utilizing previously unacceptable water sources. 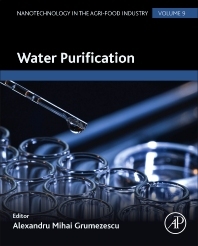 This books explores the practical methodologies for transforming water using nanotechnologies, and is a comprehensive reference to a wide audience of food science research professionals, professors, and students who are doing research in this field.